Doughty Montessori School was established in 1977. The school moved to its current location, the “Ashley Street Depot”, in 1987. The depot is an 1889 train station with all the warmth and charm of that era. The depot is conveniently located in a peaceful residential area of downtown Ann Arbor. The location offers a rich environment with many opportunities to explore the museums, libraries, parks as well as numerous cultural events. We strive to nurture the emotional and educational needs of every child who attends Doughty Montessori School. We use traditional Montessori methods and theories to give each child the opportunity to learn at their own pace in a “prepared environment”. Through hands on experiences and an open mind approach, great discoveries are possible. The primary goal of D.M.S. is to focus on the whole child, to help each child reach full potential. The aim of Montessori education is to foster peaceful, competent, responsive children who are life long learners. By creating the most beneficial environment for your child, our staff shows their commitment and dedication to this philosophy. D.M.S. admits all children and does not discriminate on the basis of gender, religion, race, handicap, national or ethnic origin. 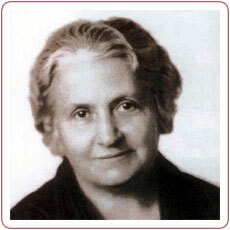 Dr. Montessori was Italy’s first woman medical doctor. Using her scientific background, she began observing children. Based on these observations she developed unique materials, a child centered environment, and parent / teacher education on the importance of the need to improve environments for the children. Dr. Montessori was the first person to revolutionize educational methods by stressing respect for the child, education through the use of all the senses and freedom of expression. Dr. Montessori was nominated three times for the Nobel Peace Prize for her unprecedented work on behalf of the children worldwide. Dr. Montessori believed a truly educated individual continues learning, because they are motivated from within by a natural curiosity and love for knowledge. The goal of early childhood education should not be to fill the child with facts from a preselected course study, but rather to cultivate children’s own desire to learn.